Container gardens have been popular since the 1950’s and have grown more popular every year since. They are especially popular today because they are ideal for people who have limited space and they can be grown indoors so that people who live in apartments or townhouses can still grow their own vegetables or grow beautiful flowers. For practicality, containers are a good choice. It gives you greater control over soil conditions. With the proper container, potted plants can be mobile, allowing the garden to be protected easily by the inclement weather-and letting the gardener maintain plantings in container gardens locations that otherwise would not sustain them. Container gardens are great on their own or they can be a nice way to add more visual interest and more plants to your traditional outdoor garden. Many people plant flowers in containers to put on a front porch or front patio or to line the walkway or driveway to their home to add curb appeal and charm. Container gardens can be grown in almost any type of container. The most popular types of containers are re-purposed items like pots and pans, vases, tool boxes, bowls, and other household items. You can also grow just about anything that you can grow in a traditional garden in a container garden. Millions of people grow herbs and vegetables all year round in container gardens. In addition to the flexibility that you get from growing a container garden it also gives you mobility because you can grow almost any type of plant or vegetable in almost any type of container. You can take your container garden with you when you move if you have an apartment or a townhouse. 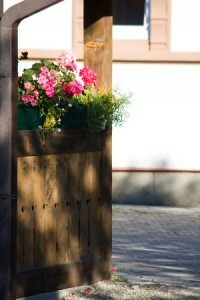 Or you can bring your container garden outdoors to dress up the yard for a special event. You can bring a container of fresh herbs to a friend’s house for dinner using the garden as a centerpiece and fresh herbs as a garnish. And when it gets cold outside or the weather is bad you can bring in any container garden that you have outside so that the plants won’t suffer or die from the inclement weather. Container gardening also makes it easier to garden because you won’t have to fight off common garden pests. Your garden won’t attract rodents, rabbits, deer, flies and other insects or any other garden pests. You’ll get to have all the fun of gardening without having to worry about pesticides, rabbit proof fences, animals digging up your plants, and all the other annoyances that cause gardeners a lot of grief during gardening season. If you choose to grow a tree or a shrub in container gardens, then you give the plant a little extra attention. The gardener’s main job when caring for trees and shrubs in containers is providing enough water and nutrients to keep the plants healthy. The only thing that you should consider when growing a container garden is that no plant can live happily forever in the same pot. Eventually, it will become root bound; water will unable to penetrate the soil, and the roots find it impossible to grow any further. When this happens, the plant will die. Trees may need to be repotted because they need more space to grow, or alternatively, a new container may be chosen purely for aesthetic reasons. Trees rely for survival on being able to produce new feeding roots annually, so one must provide this facility for plants. The signs that a tree needs repotting include slow passage of water through the soil, or slowing growth or roots appear like a coconut-fiber mat when the tree is eased from the pot. On the other hand, if you remove a tree from its pot after several years and see no roots at the edge of the soil mass, something is wrong. In such a case, the entire old solid should be thoroughly washed from the roots and replaced with fresh, open soil at the earliest appropriate time. Successful container gardening actually requires a bit more knowledge and care than typical in-ground garden. It’s vital to match the right plantings to the right container. Proper preparation will deliver the desired effect for your garden and make care and maintenance chores easier and more effective.